Blue catfish, an invasive species in the Chesapeake Bay, presents environmental challenges in the Bay watershed for a number of native species. Catfish prey on a variety of Bay species, while nothing in our watershed preys on it. Population numbers have grown in recent years, as was highlighted in a post from this summer. (See here). So what exactly are catfish eating in Bay waters? Researchers at the Smithsonian Environmental Research Center (SERC) are examining catfish stomach contents to find out for sure. Identifying stomach contents from physical remains, such as bones and scales, and through DNA barcoding, SERC has identified that catfish are eating rockfish, white perch, American shad, alewife and blueback herring. Some of these native species, such as shad and rockfish, have been the target of conservation programs in Maryland and Virginia, as these states try to sustain healthy populations of these finfish. While shad abundance is up, as of this spring, should population numbers drop below restoration goals in the future, dealing with the catfish issue in the Chesapeake will become even more important. This entry was posted in Finfish. 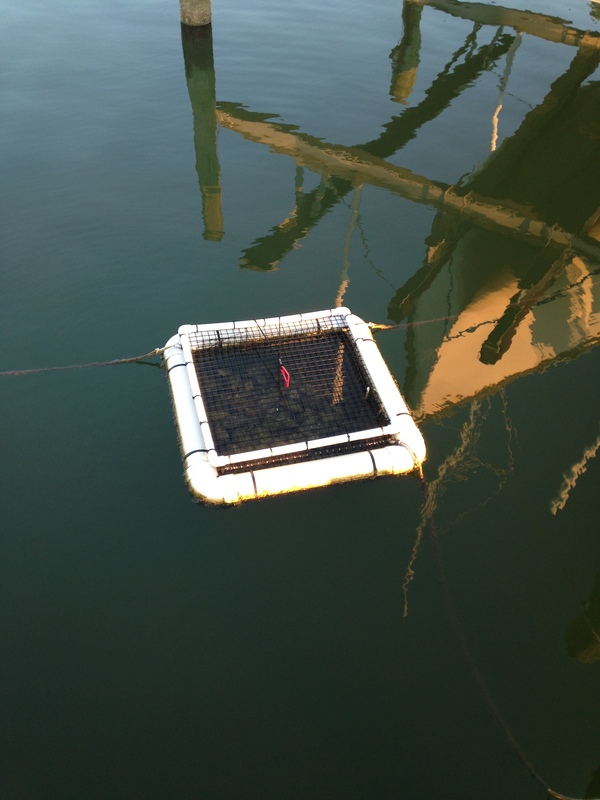 If you’ve been following this blog for awhile, you know that we’ve been growing our own oysters in a floating cage off of our dock on Virginia’s Northern Neck. 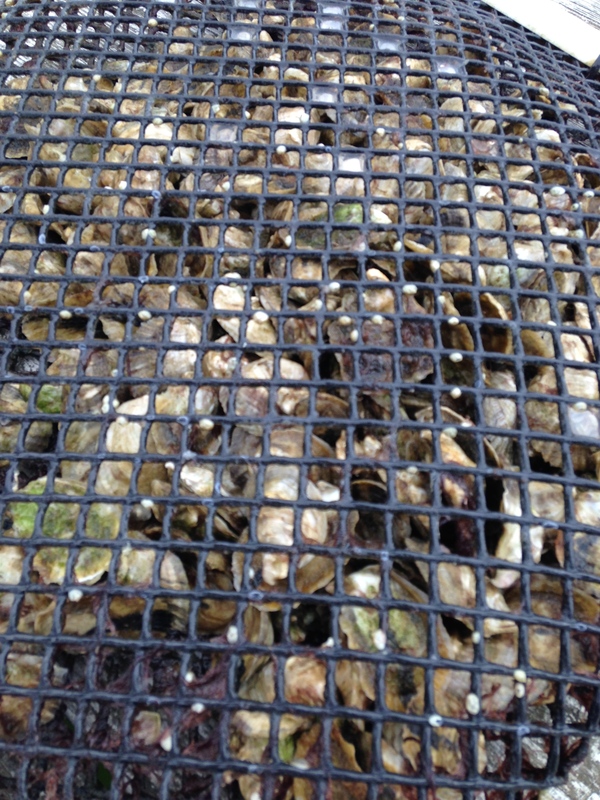 We started off with 300 quarter-size oysters, placed in a mesh bag, within the cage, last July. Three hundred oysters at the beginning of our oyster gardening project. 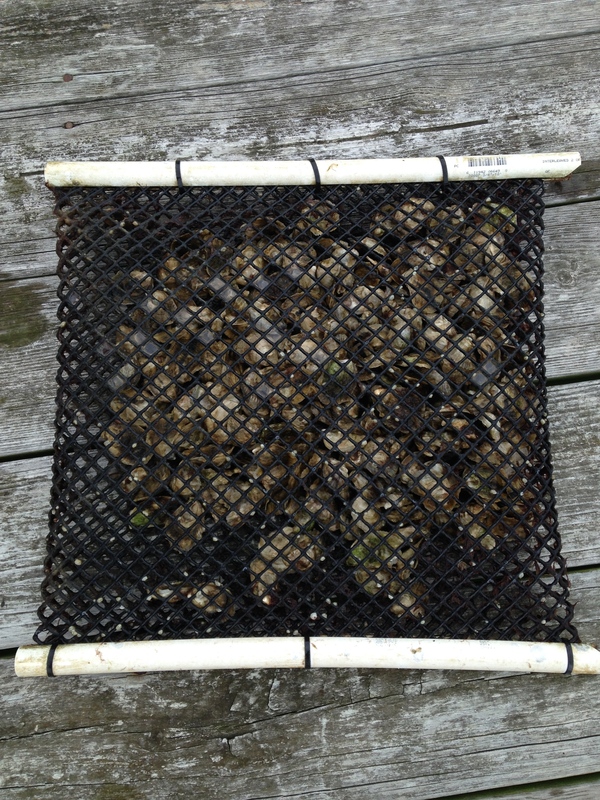 At this size, the oysters have to be placed within a mesh bag, which is placed in the floating cage. 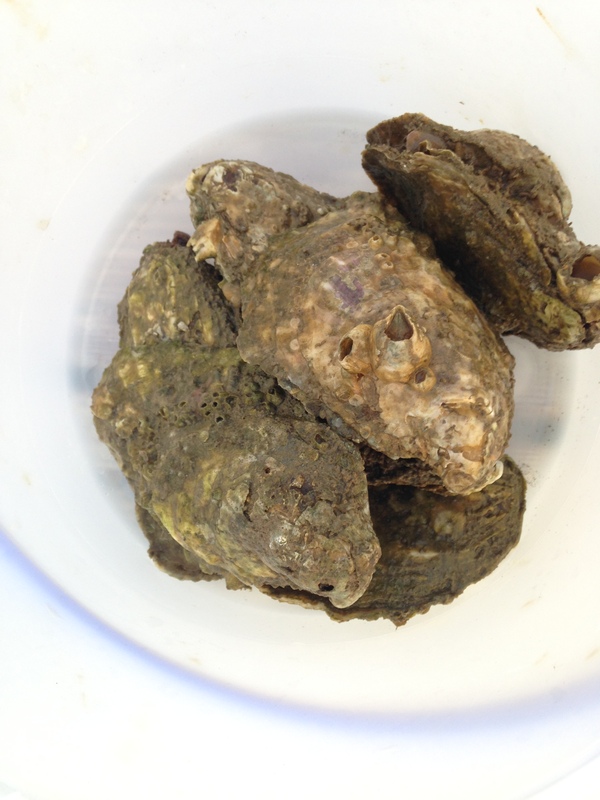 The oysters grew to be large enough to float freely in the cage, and eventually large enough to eat. We cooked the first batch just before Labor Day Weekend this year, opting to bake the first batch (the shells open on their own in the heat). We’ve since learned how to shuck, though! 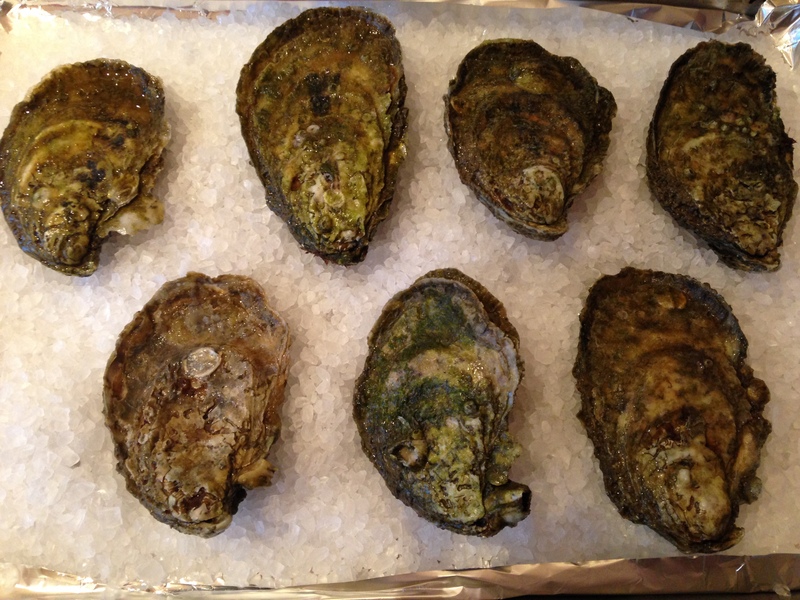 Oysters out of the cage. We lost a few oysters to predation- mostly crabs- and with the number that have been consumed, we likely have about 200 left in the cage. Hopefully we’ll be getting some more ‘oyster babies’ soon and starting the process over again. The remaining oysters floating off of our dock. 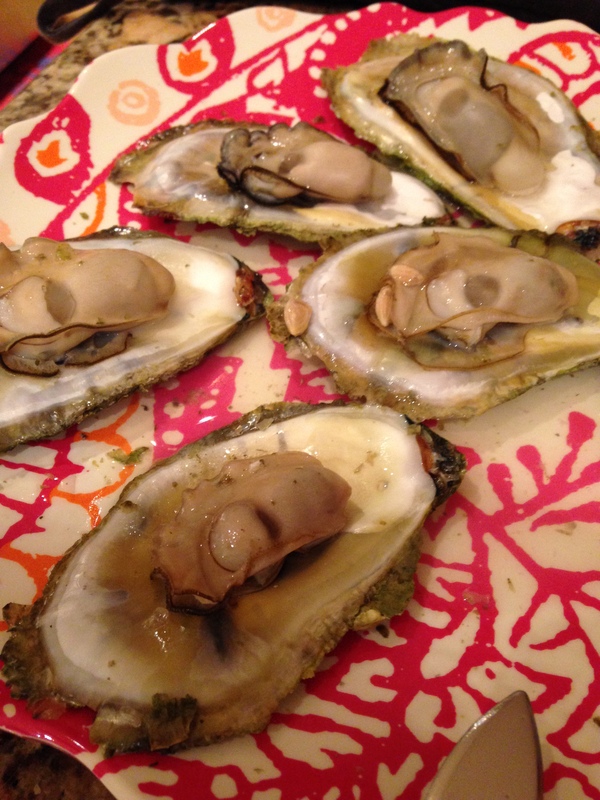 This entry was posted in Oysters, Virginia and tagged Oyster Garden. This summer we shared the rulings from the Third Circuit Court of Appeals on the American Farm Bureau Federation (AFBF) and allies vs. the Environmental Protection Agency (EPA) and Chesapeake Bay Foundation (CBF). See here. The most recent ruling from the Third Circuit was the result of an appeal from the AFBF of a lower court decision upholding the legality of the EPA’s Chesapeake Bay Clean Water Blueprint in 2010 (the Blueprint that sets Total Maximum Daily Loads or TMDLs for the Bay states and Washington, D.C.). While all Bay states and D.C. support this Blueprint, and are committed to cleaning up their watershed, pushback is coming from interest groups and states outside of the Bay watershed. These groups originally sued the EPA for overstepping on an issue that they claim should be left up to the states. The EPA argues that it has the right and responsibility to uphold the Clean Water Blueprint under the Clean Water Act. Groups, such as the AFBF, fear that the EPA’s role in the Chesapeake Bay Watershed will set a precedent, allowing the federal government to intervene in the cleanup of other major watersheds around the nation, such as the Mississippi River Watershed. Big agriculture groups fear that they would be a major target of watershed cleanup plans. As such, the AFBF and its allies plan to appeal the Third Circuit court decision, and bring the case before the Supreme Court. This entry was posted in Policy and tagged Agriculture, Chesapeake Bay. The Environmental Integrity Project, a D.C.-based nonprofit which researches and reports on local environmental issues, has weighed in on the phosphorus pollution problem in the Chesapeake Watershed. In Maryland, and especially on the Eastern Shore, there are an excess number of poultry farms. Manure from these farms is frequently applied in excess to farms in the vicinity. While recent legislation in Maryland has begun to address the application of manure, state legislators have done nothing to limit the number of poultry farms in operation, or block the development of additional poultry farming operations. The Environmental Integrity Project, (EIP), in a recent report, has highlighted that over 200 new poultry farms have been approved on the Delmarva Peninsula, with dozens set to go up in Maryland. The EIP foresees that this will likely “undermine any progress the state might achieve through its June 2015 manure management regulations.” In addition, the EIP has pointed out that, while this poultry operation expansion is going on, the state of Maryland has cut much of its water quality monitoring in and off of the Eastern Shore, due to what they cite as a lack of funds. Published with the report is an interactive map, showing where poultry operations can be found on the Eastern Shore, where manure is being spread, and where water monitoring cutbacks have occurred. The map and report can be found here. This entry was posted in Maryland, Phosphorus and tagged Agriculture. I finally have our custom weather station working on our dock on Antipoison Creek on the Northern Neck. This is a key part of our water-monitoring project. The weather station collects normal weather info, as well as water depth and water temperature. The next step is to add data collection for a variety of water quality metrics, including dissolved oxygen, salinity and PH. By collecting all these values over a period of time, we will be able to look for correlations between the weather and water quality. This weather station is totally custom, using quality off-the-shelf sensors integrated with custom software running on an Arduino. In addition to storing the data within our internal database, the information is also available on weather underground at KVAWHITE14. 30-amp solar panel, since there is no continuous AC power on the dock. Genasun charge controller and Panasonic 7.2AH battery to manage and store the solar for nights and shady days. 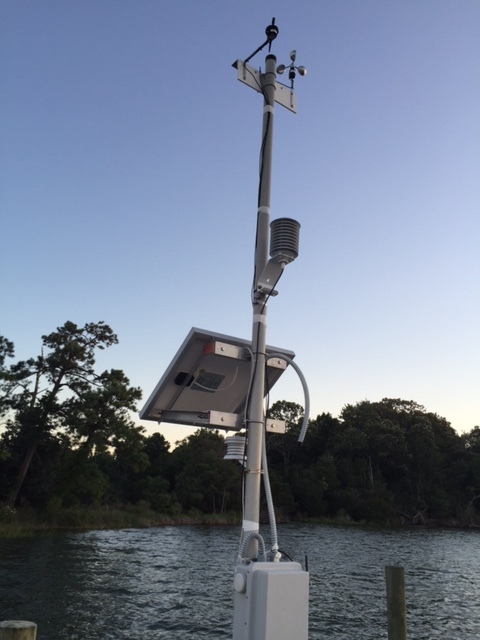 It’s all mounted on a two-part fiberglass mast from DXEngineering. The mast is screwed to the dock and one of the pilings.